Depending on when, where and how you travel to Buenos Aires, it can become a pretty expensive trip. Since we’re traveling for an extended period of time and have to keep to a budget, we have compiled a list of our 10 favorite activities to do in Buenos Aires for free: Museo De Bellas Artes and Floralis Generica: The Museo contains one of the best art collections in Buenos Aires featuring works from Rembrandt, Picasso and Degas and also some great exhibits by Argentine artists as well. While there, hop across the street to see the grand metallic sculpture, Floralis Generica by Argentine artist Eduardo Catalano. The ‘flower’ actually blooms every morning around 8am and then closes back up around dusk. Costanera Sur Reserva Ecologica in Puerto Madero: Whether walking, biking, or soaking up some sun, this is the perfect destination for those looking to escape the city without ever having to leave it. Obelisco in El Centro: Right in the middle of the massive thoroughfare, Avenida 9 de Julio, this is a symbol to commemorate the founding of Buenos Aires and reminds us of the one in Washington D.C. It is a great spot to people watch and take pictures. San Telmo Street Fair: Held every Sunday on Defensa Street, vendors display their antiques as well as their arts and crafts. Amazing people watching, entertainment, music and even fresh squeezed orange juice made while you wait! Casa Rosada and Plaza de Mayo: At the end of the busy Avenida de Mayo lays the Plaza de Mayo and the Casa Rosada. The Casa Rosada is an iconic symbol of politics in Argentina and where Eva Peron spoke to the masses. In the Plaza, you’ll find people speaking out about citizen’s rights and protesting on one side, and just a few feet away, couples peacefully walking their dogs, kissing or feeding the birds. 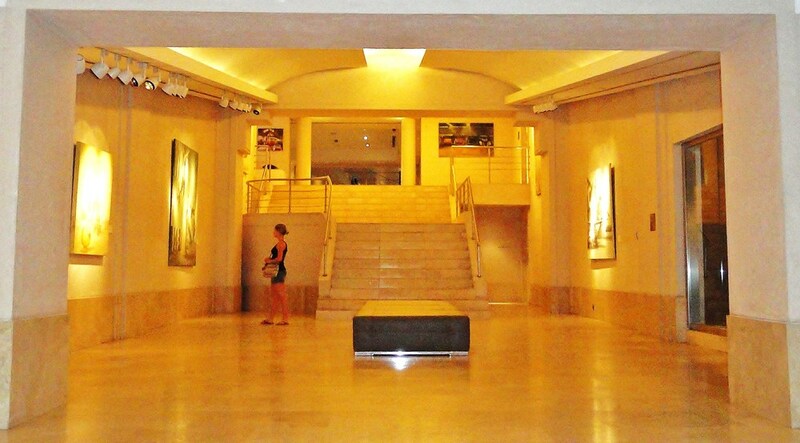 The Park Hyatt Art Museum in Palermo: This palatial hotel is the highest tier of Hyatt Hotels. You can have afternoon tea in their garden or construct your own wine/cheese tasting in their wine bar. But taking the spiral staircase down to the lower level of the hotel leads you to their art museum. It houses an eclectic series of paintings and sculptures beautifully integrated into the incredible architecture. The Parks of Palermo and Puerto Madero: Depending on what area of the city we were in, we loved to stop at parks in the barrios of Palermo and Puerto Madero. The Parque Las Heras in Palermo and the Parque Michaela Bastidas in Puerto Madero are our favorites by far and have beautiful areas to picnic, lay out or play sports! MALBA (Museo de Arte Latinoamericano de Buenos Aires): For international students travelling in Buenos Aires, the MALBA is free on Wednesdays with an international student card. Since we didn’t have one, it was $10 AR, but worth every peso. Recoleta Cemetary: This intricate maze of tombs is the burial spot for many of Buenos Aires’s most affluent families and dignitaries, including Eva Peron and prominent generals and presidents. Each tomb is unique, not only in condition, but also in the story that each tells…hauntingly beautiful. Running/Walking the River Walk in Puerto Madero: Dodge roller-bladers as you go up and down either side of the dikes in Puerto Madero. At dike #3 you can find the Puente de la Mujer which was built by a local artist and is supposed to resemble a tango position. Plenty of benches line both sides for a front row seat to some great people-watching!